From the beautiful artwork onwards this is a classy and very welcome production. CPO has invested in Goldmark’s legacy in recent years, adding Die Königin von Saba, Die gefesselte Prometheus, the Piano Quintets and other items to the mix. Now here is the promised first volume in a sequence of symphonic poems and infiltrated here one will also find two orchestral scherzos. You could hardly want for greater lyric gorgeousness than is to be found in the overture to Sakuntala. There is also writing that may remind one of Brahms, even though Goldmark was Brahms’s senior by some three years. The curvaceous lyric line especially appealed to the critic Hanslick, which was no mean achievement, but above all the detailing, some things remain uppermost in one’s mind; beautifully constructed and cantilevered themes, and writing that is richly atmospheric, evocative of its setting and orchestrated with enormous skill. Goldmark wrote Penthesilea in 1879, and it’s written like a rather less lurid Šarka. It’s bustling in the love paragraphs – a fine moment for the solo oboe – and there is plenty of Goldmark’s resplendent lyricism in this extended scena. The battle music is forceful but not garish with an epilogue of regret and foreboding. There was something of a gap until the symphonic poem Sappho in around 1893. Starting with glistening harps, the lyric solos evocate the poet before a triumphant march announces her homecoming. Goldmark is simply one of those masters of ripe romantic themes. A solo violin over harps extends the strong narrative direction of the music, leading to Saphho’s suicide and eventual transformation. The close is suitably beautiful and rightly triumphant. The Scherzo for Orchestra of 1871 incarnates some splendid rustic drone effects as well as more limpid Schumannesque writing; the rural and the cosmopolitan sit happily contrasted but enviably absorbed into a harmonious whole. The Scherzo in A major, Op.45 followed many years later in 1894 and apparently the critics at the premiere didn’t like the gloomy introduction. Well, ignore their shades and enjoy the ensuing light-heartedness of the developing motifs, and even the fugato. Fabrice Ballon’s direction is splendidly idiomatic – generous, warm, but structurally just as perceptive - and his Bamberg forces bring Smetana-like vivacity and drama to the scores. Ballon wrote the excellent booklet notes too. 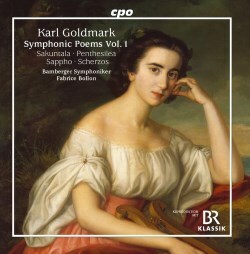 This is an invigorating, heart-stirring and marvelous disc and if you love Goldmark’s Violin Concerto prepare to be smitten anew.